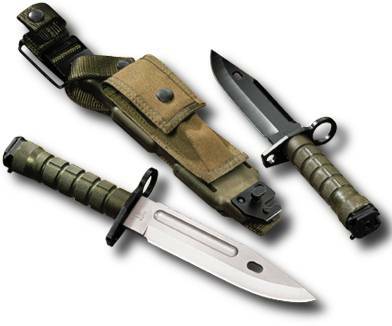 The Development of the M9 Bayonet - From Rambo to the US Military! Qual-A-Tec was a small R&D company which was formed in 1981 to take advantage of a limited partnership tax loop-hole. Fred Schumacher was a high-powered tax attorney who was looking for �acceptable� R&D developers. He met Charles A. (Mickey) Finn and talked him into starting the company. Mickey�s intensions were to develop products in support of the U.S. Special Forces. (This was before USSOCOM was formed.) The shop started in one small bay in an industrial complex at 3204 Production Ave. in Oceanside, Ca. The R&D money flowed well for a couple of years then started to dry up as tax laws changed. Mickey was looking for other markets to develop products for and decided to go into the knife development business. At that time there were several people involved in the company. Wendy Finn (Mickey�s wife) ran the front office. Bob McDonald ran the shop and he and his son produced the prototype knife components. I remember them milling the �hollow grind� in the blades with a rotary table on the mill (no CNC equipment). John Holm did all of the research and kept records for the office. Harry Camphuysen helped work on guns and since he also owned a pawn shop in Oceanside which was a dealer for Buck Knives, he had the ability to arrange for a meeting to show the prototypes knives to Chuck Buck Jr. I worked out of my shop in Indiana and produced all of the drawings and helped in design of several components including the scabbard. The �Rambo� movies were just out and Mickey obtained three of the original knives to study. The saw tooth look was �in� so it was used for the prototypes. Several blade shapes were looked at as well as handle designs and pommels. The design for the guard and the anchor pins used on the Buckmaster came from Qual-A-Tec�s association with the Seal Teams. The desire was for a way to use the knife underwater to anchor the swimmers gear to a pier or other underwater anchor point. With the creation of the Buckmaster and a partenership with Buck all set to go, Qual-A-Tec formed a new company to deal with the license to Buck and to distribute the royalties. That company became Phrobis, Ltd. Buck was looking for a product to spark the dull knife market they were in and the Buckmaster really brought them publicity. They tried to hide the origin of the knife which is one reason the history of the development was kept quiet. Qual-A-Tec also wanted no publicity so the two company�s goals worked together. When Buck started production, the width of the blade was a real problem. This was before water jets and laser cutters became available so the production options were limited. Their first attempt was a die set that would blank the part from sheet stock. It lasted for only a few hundred blades then they had to abandon that idea. They had some machined out of sheet but they finally went to a forged blade. The forge dies went through several changes as well including having the �BUCKMASTER� logo embossed in later knives. Mickey had built some prototype knives without the hollow handle. The solid handle knife had a series of holes in it and bumps to separate the fingers. Once Buck started forging the blades, this was an obvious addition to the product line. They built another forging die and the result was the Buckmaster Lite. The next development effort was the Titanium. Again, all the prototype knives were built in the Qual-A-Tec shop and utilized Buck 110 blades. The first prototypes were grit blasted then the high surfaces were polished back out. Again, I did the drawings and aided in the design of the knife. Part of the effort was to find a source for the titanium that made the handles affordable. A company was found that had a lot of scrap titanium powder that wasn�t pure enough for other products but which worked very well for the handles and clips. They formed the parts in powder metal and the result was very pleasing and affordable. The division of the royalties was somewhat different for this knife so a new company was formed, Phrobis II, Ltd. The third knife development by the Qual-A-Tec folks was the M9 Bayonet. I had found out about the Request for Proposal and drove to Fort Benning to see the people involved in the decision. We took the Buckmaster as a starting point and redesigned the blade, scabbard and changed the handle to plastic and added a steel backbone through it. We originally took M7 bayonet latch assemblies and modified them to work with the new handle. You could see the rectangular hole was drilled out to a round hole that fit over the steel backbone. We went through several iterations of wire cutter and ended up with the one on the end of the scabbard. The first cutter plates were machined from thick plate to leave the bosses on the end. When Buck went to production they had the cutter plate fine blanked which allowed them to displace the button only part way through the plate. This worked so well that if you section one after heat treatment you can not even tell that the button was not built that way. The cutter turned out to be very reliable. The file/saw surface was another matter. The bayonet could not have the broad open teeth of the Buckmaster. Since the sides of the blade are parallel and flat, when you cut through something the width of the cut is the same size as the blade leading to binding. When the first blades were made the saw teeth were milled in and a burr was formed at the point where the cutter left the part. If this burr is left on the saw works well as it essentially makes the saw wider than the blade. Buck built the first few thousand blades that way then eventually changed to a broached cut which left no burr. No burr meant that the cutting went much slower and the required energy went way up. Credits: The information above was prepared and provided by Doug Olson a former employee of Qual-A-Tec.